You and your colleagues are rarely together in the same place at the same time. On any given day, Joe could be working from home, Mary could be at a conference in Chicago and Louise could be offsite with a client. Times are changing: Your business has transitioned from residing in a brick-and-mortar facility to being based out of virtual offices and run by remote workers. This follows the pattern of the roughly 30 percent of the American population who now work remotely. Live video and audio streaming: Incorporating streaming video, audio and high-quality images into a Web-based presentation used to be a slow and difficult process. But sharing multimedia files among end users is now as efficient as loading them into a cloud-based content library and accessing them through a central content viewer. No more downloads: Now, employees can log into online meetings without having to download or engage with complicated software. Browser-based online meetings are hardware-agnostic, meaning they can be accessed over any device regardless of its make or model. Security you can count on: In the past, employers were reluctant to let employees work beyond the walls of the office for fear of losing sensitive information. In the healthcare industry, for instance, HIPAA privacy penalties can cost a business as much as $1.5 million in fees should it be found responsible for repeated data exposures. Now, thanks to the power of cloud-based, HIPAA-compliant online meetings, confidential documents can be shared easily among employees without having to worry about a data breach. 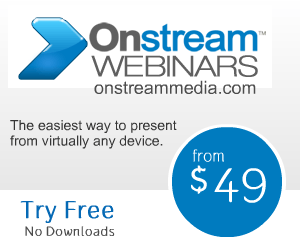 Click here to learn more about how Onstream Meetings can revolutionize the way that your remote workforce communicates.